SAN FELIPE, Baja Mexico (NEWS 8) - Scientists have decided to halt their efforts to capture endangered vaquita porpoises on the Sea of Cortez. The announcement followed the death of an adult female vaquita just hours after it was captured Saturday afternoon off San Felipe. Another vaquita calf had been captured October 18 but had to be released that same day because it was in danger of dying from stress. “There have been no additional attempts to rescue a vaquita porpoise since November 4th and there will not be future attempts during the remaining period of the VaquitaCPR field operations,” said Steve Walker, a communications advisor with the National Marine Mammal Foundation (NMMF). 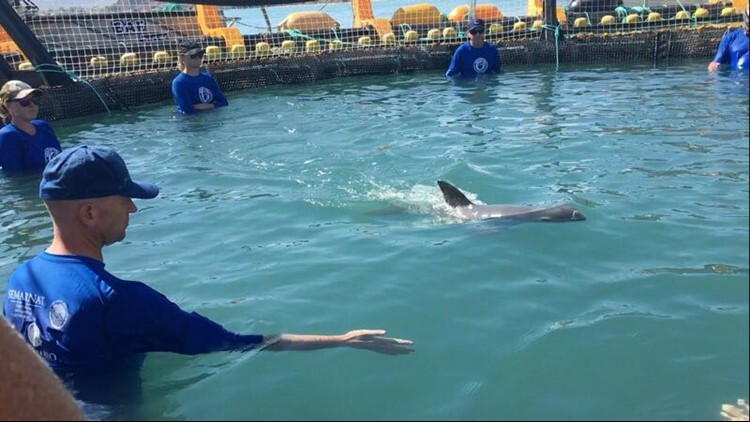 The San Diego based nonprofit has raised funds for the rescue operation – dubbed VaquitaCPR – which was aimed at establishing a captive breeding program in San Felipe. Less than 30 vaquita remain in the wild and they can only be found in the northern Sea of Cortez. Scientists blame illegal gillnet fishing for the decline of the species. The tiny porpoises become trapped in the nets and drown. VaquitaCPR included an international team of some 60 scientists. Field operations began October 12 and were supposed to last approximately one month. “Scientists will continue to photograph and document individual vaquita porpoises for conservation purposes through Friday, November 10,” Walker said in an emailed response to CBS News 8. The team has been photographing dorsal fins of vaquita in the wild in an attempt to get an accurate count of remaining individuals. Animal conservation groups had called for an end to the operation after the female vaquita died, apparently from stress related to its capture. “The key to protecting the Vaquita is defending the Vaquita Refuge and that means keeping the poachers out and removing any and all nets,” said Capt. Paul Watson, founder of the Sea Shepherd Conservation Society. SCIENTISTS BACK OFF FAILED ATTEMPT TO CAPTURE ENDANGERED VAQUITA. The notorious VaquitaCPR project is over. The scientists backed by the captivity industry will no longer attempt to capture any more Vaquita after the death of a female adult Vaquita and the severe stressing and possible loss of a Vaquita calf. Sea Shepherd warned that this program would cause severe stress and stated months ago that the project would fail. The millions of dollars spent on this tragic operation could have helped significantly with the effort to actually protect the Vaquita Refuge. Sea Shepherd has been patrolling and confiscating hundreds of illegal nets on a shoestring budget and none of the sponsors of VaquitaCPR have contributed to an operation that actually works, an operation that directly defends and protects the Vaquita Refuge. The Sea Shepherd ship FARLEY MOWAT presently in the Vaquita Refuge will be joined within the week by a 2nd Sea Shepherd ship - the JOHN PAUL DEJORIA and Sea Shepherd is working on sending a 3rd ship before the end of the year to reinforce these two ships. The VaquitaCPR Project after spending a few million dollars leaves a diminished population of Vaquita in it's wake. The estimated population of 30 individuals has been reduced by one and possibly two individuals and the entire operation has stressed out the surviving members of this extremely endangered porpoise population. SAN FELIPE, BAJA, MEXICO -- The Mexican government (SEMARNAT) and scientists from VaquitaCPR said today that field operations in the Gulf of California have come to a close as planned on November 10. This weekend, VaquitaCPR, alongside an independent review panel, will carefully review the results of the field operations and will determine, through the International Committee for the Recovery of the Vaquita (CIRVA), the next actions for the conservation, protection and recovery of the endangered porpoise, and will then notify the Mexican government through a technical recommendation. VaquitaCPR operations started in october and the team of 65 scientists from 9 countries was on the water for five full days and eight partial days during the operational time frame. Partial days occurred when winds were too great for safe and effective field work during part of the day. Conditions on 11 days were too windy for any field work to occur. Scientists reported vaquita sightings on 8 out of 13 field days. In total, 32 confirmed sighting events of vaquitas were recorded, including probable repeat sightings over the course of a day. It is important to note that these sightings do not represent a population estimate. Sighting events involved one to three vaquitas, with an average group size of about two individuals. VaquitaCPR rescue teams deployed nets on three days and two vaquitas were captured during field operations . The first animal, an immature female, was released after veterinarians determined she was not adapting to human care. The second animal, a mature female, that wasn’t pregnant or lactating, was released after not being able to adapt to human care at “El Nido”. During the second release emergency medical care was required. Despite heroic efforts by the veterinary team to save the animal’s life, she did not survive. A necropsy (animal autopsy) was performed and samples were submitted for further analyses to better understand the cause of death. A full report will be issued when all information and analysis is complete. Fresh tissue samples from both specimens were transferred to specialized laboratories for genetic studies and tissue culture. Because of the vaquita’s reaction towards human care, VaquitaCPR lead scientists made a unanimous recommendation to an independent review panel of experts to cease the capture portion of the operation. The independent review panel agreed with this recommendation. VaquitaCPR suspended catch operations on November 4 and changed the operational focus to conducting photographic identification of individual animals, to better refine our understanding of abundance and ranging patterns. Acoustic recording devices (CPODs) have been used throughout the VaquitaCPR project to help detect and locate vaquitas. A sampling grid of 36 sites was designed to monitor vaquita acoustic activities in the previously known zone of high activity. The sites covered mainly the central, southwest and west portions of the Vaquita Refuge. Acoustic detectors were deployed in this grid on October 11 and were exchanged daily when weather allowed. Due to the dynamics of the acoustic detections, it was decided to deploy eight more acoustic detectors in the northeast portion of the Refuge on October 29. Hence, the grid was expanded to a total of 44 monitoring sites. In total, 112 acoustic encounters with vaquitas were gathered from 21 of the 44 sampling sites. Acoustic activity was very localized, mainly occurring in 5 sites. Scientists used the acoustic encounters to determine which areas to focus on during efforts to locate vaquitas and this information can be used to concentrate long-term protection and monitoring efforts. Similar to sighting events, acoustic detections do not represent a population estimate. “Vaquita conservation is part of the President’s agenda and will remain a top priority ” said Mexico’s Minister of the Environment Rafael Pacchiano Alamán in an interview yesterday. Conservation projects supported by the Mexican Government through the Ministry of the Environment (SEMARNAT) and the Mexican Navy (SEMAR) have also been working alongside of VaquitaCPR for the conservation of the vaquita. These projects include support for gillnet ban enforcement and gillnet removal, key conservation elements for the long term survival of vaquita. “While field operations end today, VaquitaCPR stands for Conservation, Protection and Recovery of the vaquita porpoise” said Dr. Lorenzo Rojas-Bracho, lead scientist from SEMARNAT for CIRVA and a lead scientist with VaquitaCPR “We will not give up, we will continue our efforts to save the vaquita."